In December, Doña Máxima expressed dismay about her husband, Don Julio, being nominated by the Huancarani residents as the 2015 mayor of the community. Each rural community has 4 public service authorities. The Presidents of the political Women´s Organization and Men´s Organization work with the municipal government for community development through municipal funding. The Corregidor is responsible for resolving civil disputes not requiring police intervention. 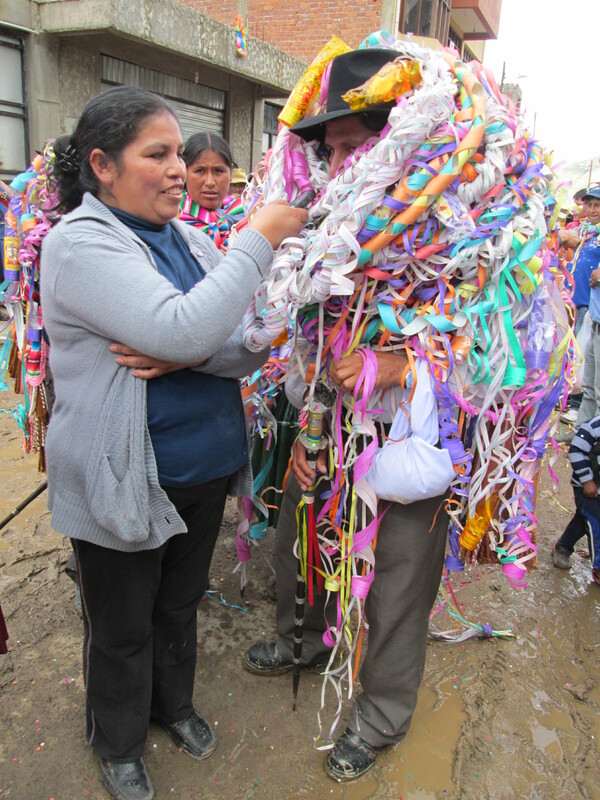 The mayor is the social leader tasked with maintaining the community´s traditional rituals and fiestas. She had reason for concern due to the expense and because the work burden falls heavily on the shoulders of the mayor´s wife. Besides the tin staff of office a mayor must be outfitted with a new poncho, an aguayo, a ch´uspita for carrying coca leaf, a belt and a knitted ch´ulo (Andean hat with earflaps). 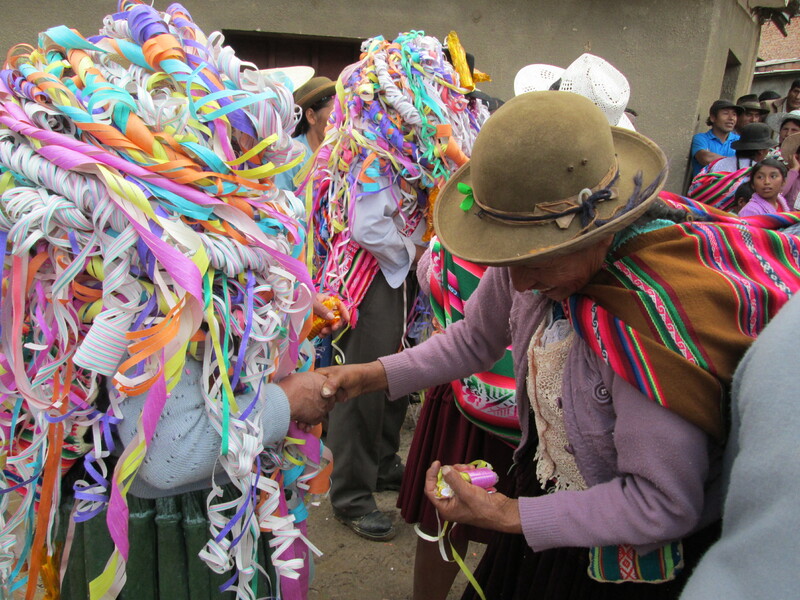 All must be woven or knitted with brightly dyed synthetic yarn, because natural dyed sheep´s wool is no longer “traditional” for fiestas and rituals. Harking back to her adolescence when she competed with her girlfriends to weave the finest aguayos to wear in each year´s Carnaval, her commitment would be to outfit Don Julio in woven masterpieces. 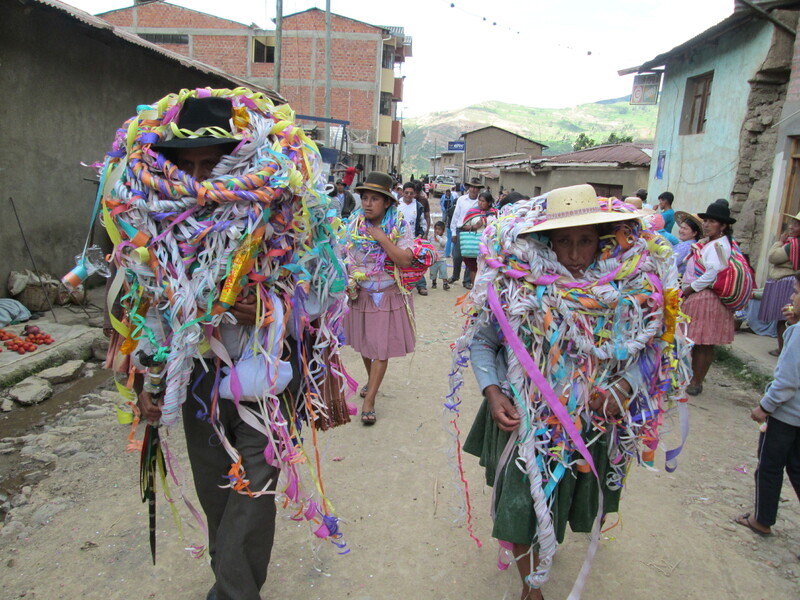 The feasts for the fiestas are the responsibility of the mayor, although community members help by donating firewood for cooking, goats, sheep, potatoes, etc. Anything not donated must be paid for by the mayor. The cooking, the 3 day preparation of chicha, and the cleanup are the responsibility of the mayor´s wife, although she can count on help from other women. Because Doña Máxima and her family live in Independencia there would be the additional expense of contracting transportation to fulfill the mayoral responsibilities in Huancarani. The President of the Men´s Organization of Huancarani and the Corregidor tried to track down Doña Máxima last Saturday night, but she hid out. They knew Don Julio could not accept the position without his wife´s consent and participation. On Sunday, Don Julio showed up at the PAZA store with the President and Corregidor while Doña Máxima was working. Feeling pressured, she left the men talking, and went to sit on the stoop by Dorinda to talk through her concerns and make her decision. Financially, the family barely scrapes by with life´s necessities and because they don´t farm or have livestock they will need cash to purchase whatever is required to meet the mayor´s obligations. When asked for an opinion Dorinda was caught up in a mental debate between the unfairness of the mayor’s wife’s workload vs. dying cultural traditions, and not sure what to say. She pointed out that as Huancarani landowners the social obligation wasn’t going to go away, and that the weavers who will go out of their way to help with the workload are ageing. It was obvious Doña Máxima would bow to the inevitable when she mused that she was considering using a double weave for the aguayo, a technique she said she hadn´t attempted in over 20 years. 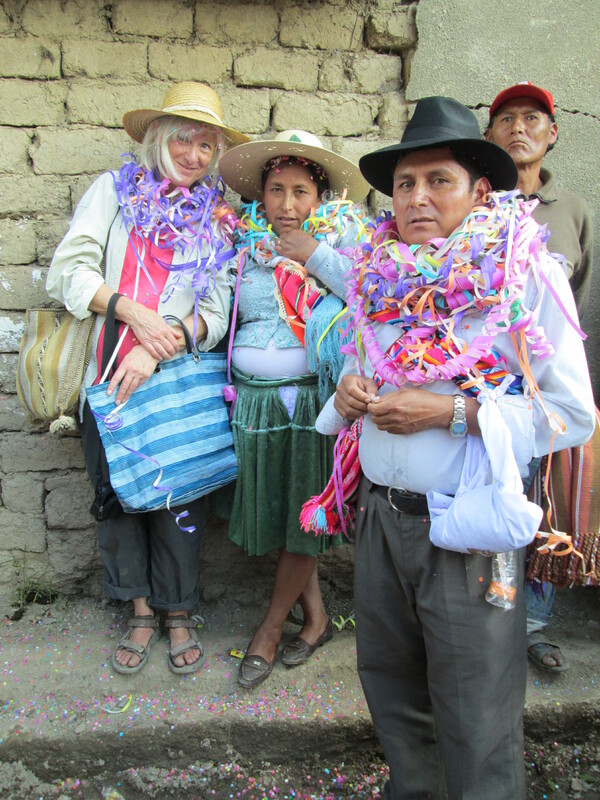 She said she would have started plying the yarn, but didn´t have the funds to purchase it. She asked for Dorinda´s support to meet the responsibilities as Huancarani mayor and wife. Dorinda agreed for herself and for all of you who wish to participate. 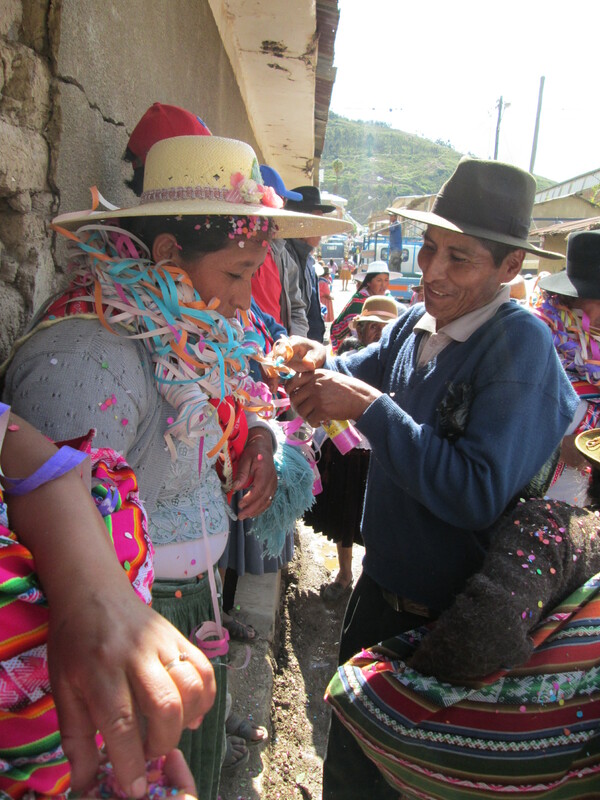 Her first gesture of support was a personal gift to buy yarn so Doña Máxima could start weaving the aguayo. 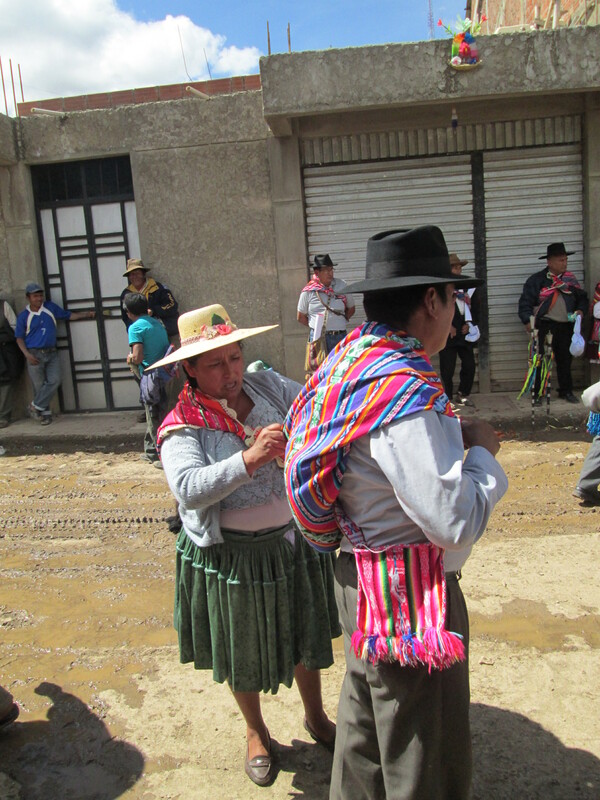 The President of the Men’s Organization walked up to the women with coca leaf, a ritual Doña Máxima doesn´t follow. There was a long uncomfortable pause before she cupped her hands to receive the ceremonial leaf and the responsibilities as the wife of the mayor of Huancarani. 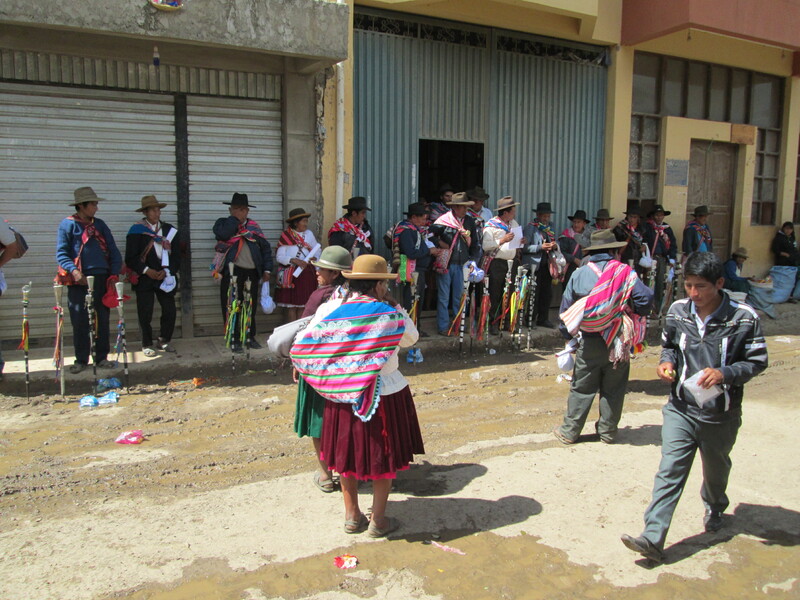 Later that afternoon all met in front of the Centro Sindical building where the 27 new mayors from rural communities were inaugurated in a brief outdoor ceremony. Don Julio, Doña Máxima, and their daughter Vilma all wore factory made aguayos. Doña Máxima had artfully arranged an edge of a borrowed poncho to hang out one side of Don Julio´s aguayo. His ch´uspita had been woven by her sister.